We’ll start with the cheapest one: the Farm Daughter Floor Mirror. $115, poly. This mirror, as well as the following two wooden mirrors, come in Pooklet’s eighteen naturals + Time Bomb. You have Volatile above; the rest are shown below, in the order they appear in game (i.e. alphabetical order), not by family. Also, the pictures are taken outside to do the colours justice, so the bump mapping appears sharper than it does indoors. Next is the Phickle-Phyfe Carved Floor Mirror. $675 and poly, but also in the higher range. This one is my favourite. 🙂 (I seem to prefer mirrors with ornaments that require slave subsets, since that was the kind of mirror I liked the best the last time as well.) Again I won’t show you all the recols since they’re the same as for the Farm Daughter, but I will tell you that the ornaments look the best on lighter recols – you can see the details better on those. Our next contestant is the Advorton War Mirror – $925, also poly in the higher range. In addition to the original TSM colour above, it has five recols for the base and five for the frame, some Pooklet’s naturals and some CuriousB’s ACYL colours. You can of course mix and match the recols till your heart’s content; this is just the order they appear in game. For all of you Targaryens out there, next we have the Looking Glass with VermenKrakki Minick – $1,135 and poly (>1,600). Believe it or not, but you don’t get any Pooklet recols for this one. 😛 Instead it comes in eight ACYL colours, together with the TSM original seen above. And last but not least, the Unabominable Krustallos of Seljaq-Ghazhadid (don’t look at me like that, I just work here 😛 ). This one is poly, over 2,500, so handle with care if you’re on a slow computer. (Of course, handling with care is generally a good idea when you’re dealing with dragons, since they, you know, breathe fire and stuff.) The price should also be handled with care – $2,100. 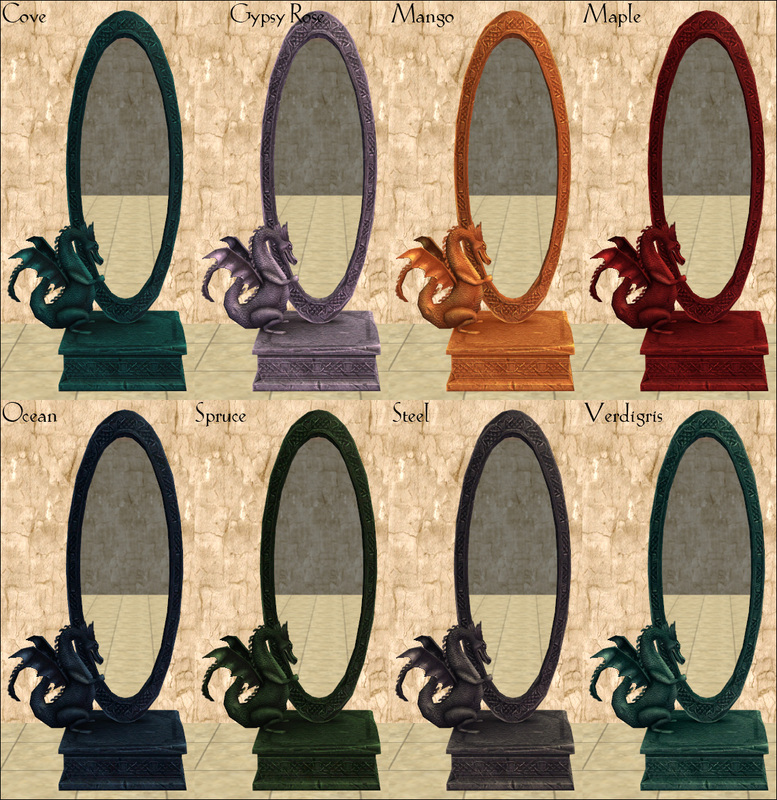 Since this mirror comes in the same ACYL colours as the wee dwaggie above, I won’t have you scroll through all of them again, either. This entry was posted on 5 February, 2014 at 22:12	and is filed under BUY MODE, CONVERSIONS, Decorative, DOWNLOADS, Medieval-ish, Objects, THEMES, TSM. You can follow any responses to this entry through the RSS 2.0 feed. You can leave a response, or trackback from your own site. You’re very welcome! I’m so glad you like them! Beautiful conversion and presentation, no surprise there. The star has ascended. Thank you, NixNivis! Awww Nonni, you sweetie, you always say such lovely things. You’re making me blush! YEEESSSSSSSSSS! THE DRAGON MIRRORS! I’ve wanted these for so long and even tried to convert them myself but I apparently fail at making mirrors. Thanks Nix! Wow, these are AWESOME. 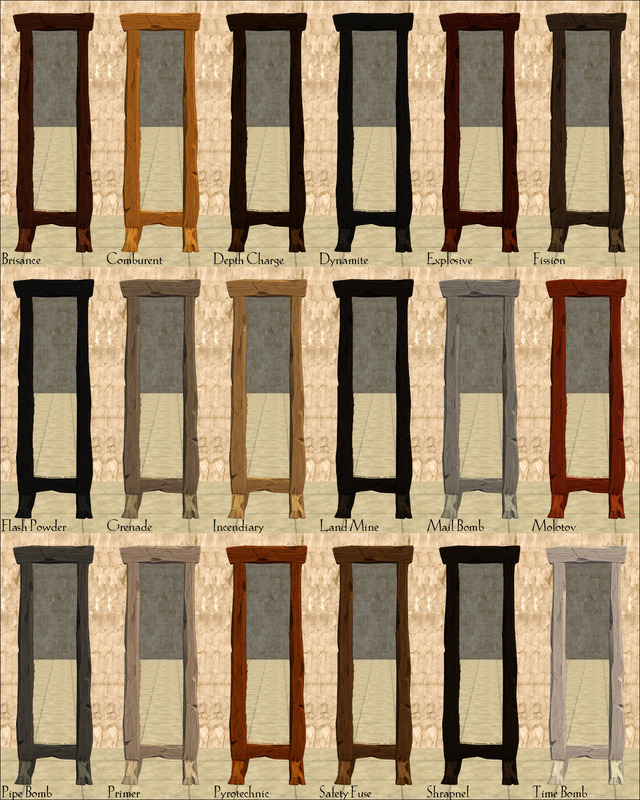 I know of a few houses in my game that’ll be getting that Advorton War Mirror, the color options on it are really nice. 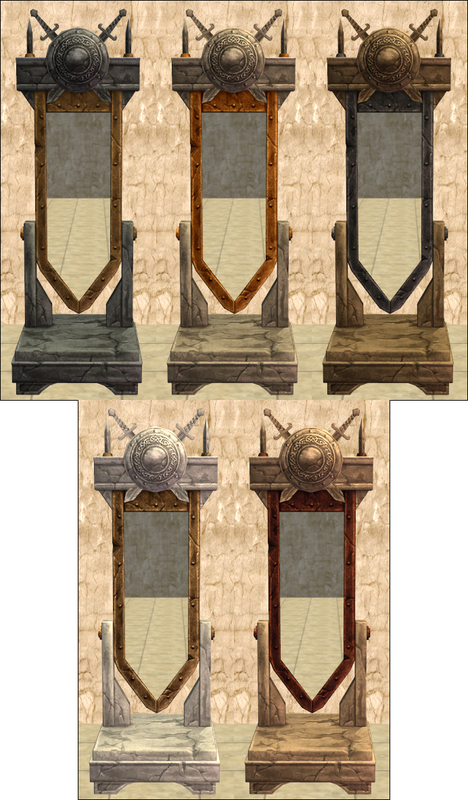 I needed some mirrors like these for my house, Especially the dragon and the Sword & Shield mirrors. Thank you! !